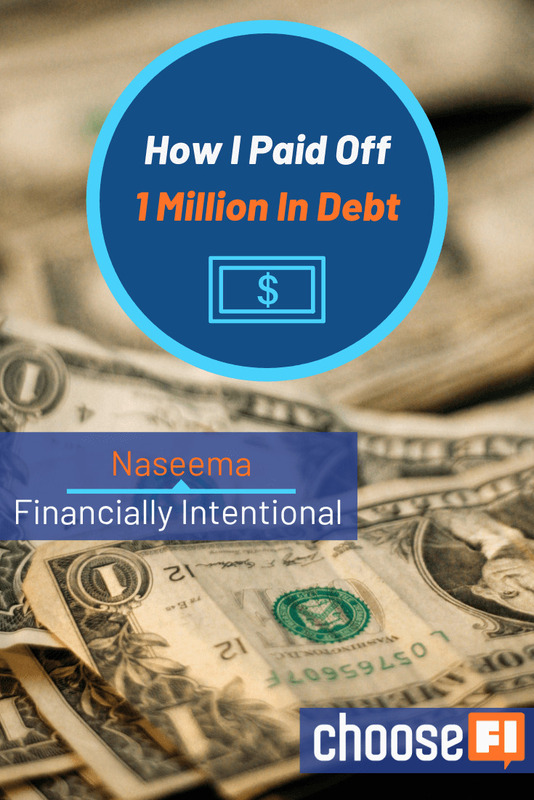 Naseema McElroy, a registered and practicing nurse and blogger at Financially Intentional, explains how to accumulate $1 million in debt, and how she earned her freedom through financial independence. How does someone accumulate $1 million of debt? Naseema is from West Oakland, Ca., where she was taught to either join the military or go to college. She attended the University of Southern California for both her undergraduate and graduate degree, then later completed an accelerated nursing certification program at the University of California in San Francisco. Floor nurses where Naseema works earn above $200,000. How could Naseema have been significantly more efficient with her college education? Many nurses have two jobs: Naseema works part time with benefits (three eight-hour shifts), and a per diem job (two 12-hour shifts) without benefits, at a higher pay rate. Even after finishing her education and working full time, Naseema accumulated more than $1 million in debt, and was living paycheck to paycheck. Most of her debt was student loans and Bay-Area mortgage costs. What inspired Naseema to move from a 5002ft apartment closer to the city into a 40002ft home in the suburbs? Even with the house and the car and the seemingly perfect set up, Naseema did not feel secure, and even owed her family money. Dave Ramsey set Naseema on the course to pay off her debt. Once Naseema began tracking her expenses, she was an early user of Dave Ramsey’s Every Dollar app. A zero-base budget is projecting how much you’ll earn and set aside how much is intended for paying off debt, then adjust the remaining numbers to reflect other obligations and other adjustable expenses. What inspired Naseema to begin blogging at Financially Intentional? Before Naseema sold her suburban house, she had already paid $300k of debt. Naseema chose to leave one of her jobs when it became an unhealthy environment, because living debt-free gave her the room in her budget to do so. Currently, Naseema has moved out of the Bay Area and commutes back into the city 6 days a month for work. Building wealth is a mindset. You have everything it takes to be successful. I love her! “The feeling of every check being optomized” “You have everything it takes”. The interviews with individuals are great but I wish you’d do some more podcasts on topics–investments, “how-tos”, etc. 1. Hard work. She described it as a “grind” and I would, add with a purpose. 2. Educate yourself financially as soon as you can. She could have avoided some student loan debt by understanding what she was getting into. (lesson for all parents of kids high school kids). 3. You can dig out from any hole if you really want to. Thanks for giving us excellent examples of how to get this done! I find it quite ridiculous that she could not make ends meet with a 200k salary (and that a nurse can have a 200k salary, here in Spain they are paid around 25k per year). I can save money (not much) even with a 1600$ salary while paying a 1000$ rent and travelling internationally twice per year (two weeks per trip). BTW I have a chemistry degree and a master’s. Such a great episode. Inspiring. Keep up the good work. Very interesting podcast and certainly shows that a good income and meaningful spending and paydown plan can really make a big accomplishment in getting debt-free even if you make financial mistakes earlier in career/life. One small note: as a fellow non-California resident earning income in the state of California: all income earned in California is taxed by California regardless of where you live. Some good geoarbitrage for sure with lower cost of living, but Cali will still get you come tax time (I assume Naseema knows this but don’t want other listeners thinking thats a great tax arbitrage move for California). managed to accumulate debt while having 200K salary and living in West Oakland. Here on the east coast salaries are not that inflated. Nurse practioners make upwards of 90,000 and a staff nurse 75,000. Thanks for the interview. Brad, Jonathan, why didn’t you include Naseema’s site in the shownotes like you do for most of your other guests? I don’t think I know of any other episode where you forget to link your guest’s site. I love her she definitely inspired me being a nurse as well and young African American woman, I understand that two three job hustle mentality. I was able to pay off all my debt 60k last October and feel that freedom of not owing everyone anymore. Thanks again Naseema! !